AFTER a meeting with Sinn Féin on Thursday evening, Dublin City Council bosses confirmed that Seán MacDermott Street Swimming Pool will be kept open for the remainder of the year. But they have refused to guarantee the pool’s future for the longer term. 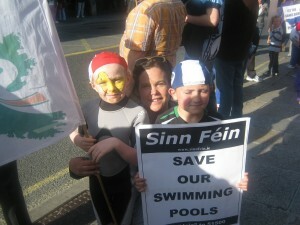 Sinn Féin’s Mary Lou McDonald has criticised Labour, Fine Gael and Independent councillors who supported the city budget responsible for creating so much uncertainty about the pool’s future. “We were particularly disappointed that Independent and Labour councillors supported such an inequitable budget,” Mary Lou said. “Targeting inner city areas for cuts in critical service provisions simply does not make sense on any level. Yet this is exactly what Labour has done by supporting this year’s budget.